#BadPsychics: Mediumship is Impossible, but will it always be? Mediumship is Impossible, but will it always be? Science tells us that mediumship is statistically improbable but will it always be so? Presenting information, verifiable or otherwise. Causing so-called paranormal activities to occur. Channeling forth certain types of energies. Manifesting themselves for objective examination and/or identification. Lets put it into simplified terms. Mediumship is a living person communicating with non-living person. "How can you know it is impossible, have you tested every medium on the planet"
"You can't prove mediumship does not exist"
To answer the first statement, I don't need to test every medium on the planet, history has shown us that mediums cannot back up their claims. And to answer the second statement, you cant prove a negative, can you prove that invisible midgets wearing pirate hats did NOT just sing a symphony on Jupiter? Of course not, but that doesn't mean it ever happened. Science and specifically biology tells us that when we die, and our brain ceases to have activity, that's it for us, we are dead, no coming back. As of today there is zero % proof of life after death. Now here is my question, I know mediumship is impossible because science tells me so, but will it always be so? Travelling to the moon in the year 1876 was impossible, travelling to the moon in 1925 was impossible. But in 1969 it became possible after it was achieved by the late Neil Armstrong. He did it not in a magic car, or by going through a wormhole he did it by using rocketpower. So what does that tell us? It tells us that with technological advances, almost anything is possible eventually. So how does this pertain to mediumship? It is pretty clear to most intelligent people that mediumship in its current form is not only impossible but always will be impossible, but mediumship in the broader sense of the word "To communicate with the dead" may not always be impossible, how? well that's where we go back to science and the advancement of technology. If mediumship is the ability to communicate with the dead, well what if in the future we develop a way to digitise our thought patterns, our very mind transferred to a computer, we would in a way continue to exist long after our body, our brain and our mind had long turned to dust. So to communicate with such a digitised version of someone could be considered mediumship. What about if in the future we are able to communicate with a parallel universe, identical in every way to our own, except that life started on the other Earth say 20 years after it did on our own. You could speak to your own dead mother years before her death in the other universe. Would that not be a form of mediumship? There are many more ideas, all of which are rooted deep in science and technological advances, and not in spiritualism or the church. So keep in mind when I say something is impossible, it doesn't mean it will always remain impossible, but it may mean that you need to redefine that what it is we are deeming impossible in the first place. You had me worried there! Mediumship is impossible? No. Mediumship exists. Difficult to prove scientifically? Yes. But will it always be ...? That's the big question. How can you say something exists when it has never been proven and is biologically and scientifically impossible. You are using faith or religion to deny what is scientifically factual. Wow! Great to see you PK1! God save us from pseudo-intellectuals and their inane ramblings masquerading as intellectual analysis ! Sadly, Jon, all your "knowledge" of mediumship is second-hand or based on mere dubious assertions. You have never experienced great mediumship because your aggressive negative attitude has prevented you from attending the demonstrations of any half decent medium. Quite simply your closed mind "anti" stance meant that you were barred and never allowed in, therefore denying yourself the opportunity for first-hand judgment. And by the way, one CAN prove a negative so don't just regurgitate what others have said that sounds logical or is appealing to your bias. If you made a statement "Your dog is crapping on your lawn" I can prove that in the negative by demonstrating that my dog is sitting beside me here in my house and therefore cannot possibly be doing that. So, if that assertion is the epitome of your investigative ability, I fear you still have far to go. And a skeptic (or sceprtic to give it its proper English spelling) is someone who doubts, NOT someone who disbelieves. Remember that humans are currently using just 10% of their brain capacity. What if they started utilising more? What new skills could we develop as a result? I'd say, anything is possible, including the parallel universe. It may sound whacky today, but who knows? We actually use 100% of our brains, just not all at the same time. If we didn't evolution would have removed the parts of the brain we didn't use. Also any brain damage, even a tiny amount can cause catastrophic effects. Thanks for your comment, I never claim to be an intellectual, in fact I often state the opposite, I left school at 16. So wrong on your first point. As for my knowledge on mediumship being second hand, again wrong. As my 7 page featured article in The Skeptic magazine would tell you, everything I talk about I talk about from first hand experience. I have stood on stage and given readings to a room full of people, I have studied and experienced every kind of mediumship, FIRST HAND! Also there are no "half decent" mediums, I have exposed them all! Although feel free to name a half decent medium I have not exposed, and I will happily go investigate their claims! Also worth noting that I will ONLY now visit mediums that do NOT use entertainment disclaimers, as it seems a bit silly to see a medium that admits what they do is just an entertainment act! Bit like going to see David Blaine and they writing an article how everything he does is just magic tricks! Lol. Also I have never directly been barred or refused entry to any mediumship event. In fact I am regularly invited free of charge to see medium shows! Derek Acorah, Colin Fry, and many others have invited me to view their shows! Dont believe me? There are two BIG name mediums you can go and ask. Derek is on Twitter, and Colin is on Facebook! Let me know what they say! I was also once invited by Craig Hamilton Parker to study at his centre. Nice try, but so far proved you wrong on everything you have said! As for your dog? Why would I assert that he was doing something that I can plainly see he is not? That would be silly. Also you are positively proving your dog is sat next to you. So not sure how you are proving a negative, you are stating a positive. I do understand the issue you are raising though regarding proving a negative, please let me clarify what I mean when I use such a statement, I only use such a statement within the realms of the paranormal. SO when someone says "can you prove that God does not exist?" The point of saying this means that by not proving he does not exist means there is a possibility he does, but the reality is there is no evidence he does exist. In fact I could in theory try to prove God does not exist, the problem is everything I do to try and prove this "negative" would face a response. To prove God does not exist, I will find a priest and a terminally ill cancer patient and tell him to make the following prayer. "Dear God please cure this child of cancer"
"It was Gods will he died"
"God cant reply to all prayers"
Everything you do to try and prove a negative within a paranormal or supernatural arena can be countered with something that still suggests that the paranormal event is real. Again nice try with your proving of a negative, even if you got it a bit wrong. I hope you now have a better understanding of what I am saying. I also suggest you do your research about me a little better than 2 minutes on google! Im not saying mediums are actually real, or fake... But i am saying that many people can do amazing things, that scientists claim not to be able to do... a witnessed man that can conduct electricity with his own body... and i seen blind man, that acts as a bat clicking his tongue, and hearing sound waves, in order too get images so he can walk, ride a bike etc, and not actually be able too see. ! now thats qamazing! Humans defy what scientists say each day... so therefore keeping a open mind, we as humans may be able to speak/communicate with other beings or even read others minds, and get info they remember rather than actually a sprit. We can not be certain either way as you say. I for one have seen a meduim that actually amazed me, she did not charge for services, Nor did i give her my real name. But she gave me full names, things no one, except i knew and more. Then i have witnessed hundreds of so called readings, that were not anything to take notice off. Blatent cold reading, and asking questions, to get a answer, then claim you had said it to begin with. So I am not prepared to say spirits do not exist, Nor than people may be able to speak to them. As keeping a open mind i see things for what they are. And can spot so many frauds a mile off. I feel if they were not given such a large availible platform too do there 'meduimship' we would not have so many taking money off innocent people. If indeed they have this amazing gift.... and wish to help... why charge? I would never even take a second look at someone that charges. As i said they lady i spoke to did not ask a penny and never has. She is in her 60's and is disabled, blind, and has a problem menanig from age 4 she has never walked. But again, she too could be scamming people, but im more inclined to take her seriously, and watch how she works, to maybe get some evidence.... than those that charge alot of cash to do nothing. The human body is capable of some amazing things, but ALL of the things you mention can be explained by science. Whether it is using some kind of "Human echolocation" or someone with a high tolerance of pain being able to withstand higher electrical currents to a normal person. Remember that with ever great discovery, there is a scientist who proves it. We have been studying psychics and mediums in proper scientific settings for over 160 years, yet we have no proof whatsoever. History has told us that psychics fail 100% of the time when the chance to cheat either consciously or subconsciously is removed. As for the medium you saw who amazed you, surely you were not taken in by the fact she was supposedly blind, disabled and so on. If anything mediums with disabilities are often more successful because people pity them and use their disabilities as an excuse. Sharon Neil is an example of that, she is a blind psychic who has gained some fame, yet she uses the exact same methods as many other fakes. Also the vast majority of psychics earn a basic living, they are hardly all millionaires, so money although an obvious motivation, is rarely the main thing. In my experience of dealing with hundreds of mediums over the years, the motivation after money is nearly always ego. Also remember that many mediums will simply have deluded themselves they have powers. Receiving validation that you were right from a grieving person with tears streaming down their face is enough to convince almost anyone they have magic powers. I myself have come face to face with someone in that exact situation after i gave them a reading, and i NEVER cheated, I never cold read them. So thats another problem, unless you have a deep understanding of how it all works, and not just the obvious frauds, it can often be hard to spot the most convincing of fakes. Never let age or disability be a factor in why you believe in someone. Doris Stokes played off her age as part of her gimmick. All age means is they have had more years to perfect their craft and the art of the con. Mediumship is impossible right now, as spiritualism defines it etc, it is 100% impossible and that will never change. "And that will never change"? Isn't this entire article about how it could change due to technological advancements? Mediumship AS SPIRITUALISM defines it is 100% impossible and always will be, any technological advancements making it possible in the examples I mentioned in the article above will have nothing to do with spiritualism. The more science advances, the more religion and religious explanations for things take a step back. Spiritualism is not a true religion, it is purely based on fraud, whereas Christianity asks you to believe in God through faith, spiritualism tells you to believe in an afterlife through the simple act of fraud, that being mediumship. 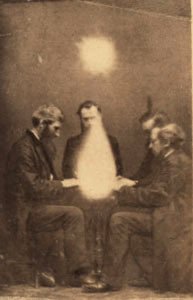 Mediumship and spiritualism has remained basically unchanged for over 150 years. After he died, my grandfather came to me in a dream and showed me that in the future there would be a dangerous medicine that would let the living talk to the dead, but that I should avoid it because it was dangerous to those not yet born. The mistake scientists are increasingly making is confusing their epistemology for ontology. Your statement that there is zero evidence for life after death is false. There just is no evidence that can't be excluded if you have a foregone conclusion in mind and regard reproducible phenomena as the only kind that exists. Many people, for thousands of years, have had experiences that contradict your beliefs, but you disregard them because it can not be translated into an objective test. Your subjective consciousness is the only mechanism you have for perceiving the world, but you disregard the experience of others that can not be proven to your satisfaction. Are you really looking for truth without bias, or are you simply enshrining a certain type of egotism? The evidence you claim is the classic personal experience claim, aka anecdotal evidence, which is easily dismissible. For every person who claims one thing there is another who claims the opposite or at very least the two claims are contradictory, both are equally convinced so who is right ? I'll give you a clue..... The one who can back up his claim scientifically.